Four windows are being replaced on the entrance side of the Courthouse. The wood has rotted and the windows themselves were in poor condition. Contractor David McCain is replacing the windows for us and a generous grant from Southern Foundation is funding most of the work. We are sorry for any inconvenience, but will announce here and on our Facebook page when we are able to reopen for weekend tours. Thanks for your understanding. Well, Memorial Day weekend has come and gone. We estimate that at least 200 people visited the courthouse during our celebration. Please go to the "Photos" tab and click on "Memorial Day Weekend 2012" to see pictures from the weekend. 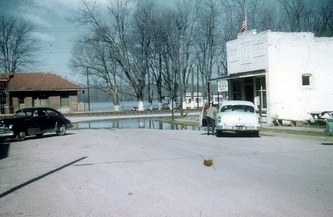 Thebes Historical Society. The lucky raffle winner, Deborah Wehmeyer, got to take it home on Memorial Day weekend. 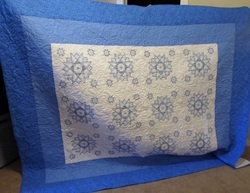 We plan for a quilt raffle to be an annual event at our Memorial Day celebrations. For those of you who purchased tickets, thank you for supporting our efforts to maintain the Courthouse. We can't wait to see what Faye's masterpiece will look like next year! And the winner is... Debra Wehmeyer of Thebes, Illinois. Shown in the photo is her mother-in-law and Thebes Historical Society member Blanche Wehmeyer, who sold her the winning ticket. In the past several weeks we have had so many wonderful volunteers helping us with the daunting task of cleaning up in and around the old courthouse. 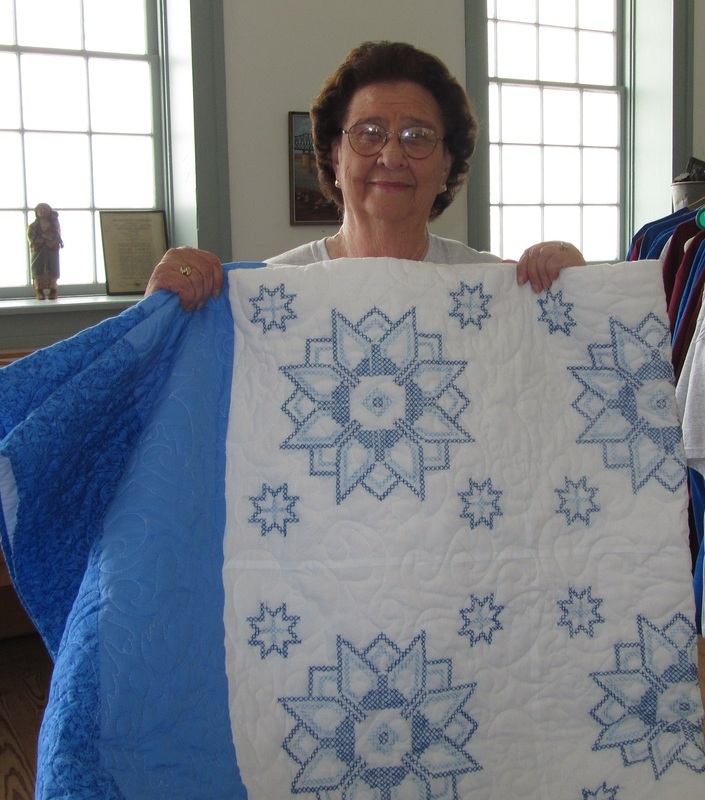 Although most of the historical society members have been involved and helped out, Twyla Wareing has been at the forefront with organizing, scheduling, staying on-site and joining in with the hard physical labor required. Fortunately for us (but maybe not for him) she has even enlisted the help of her husband, Everett. Thank you so much, Twyla. We also appreciate the TAMMS PRISON WORK CAMP and the young men from Kappa Alpha Order at SIU Carbondale for their hard work with removing the weeds, brush and saplings from the hillside in front of the courthouse. Thanks to Jim Smiley and J.C. McNelly, the bees have been removed from underneath the balcony. It is not an easy task but we can accomplish a lot if we all do a little! 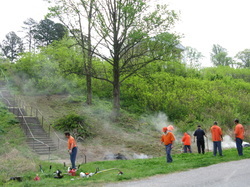 Check out our photos for more pictures of the cleanup progress - thanks to help the from Tamms Prison Work Camp. the guard and work crew - we couldn't do it without you! Plans are being finalized for our Memorial Day activities at the Courthouse on Saturday, May 26th and Sunday, May 27th. You can see our plans on our NEWS page, Memorial Day weekend plans 2012. Plan to come by and join the festivities as we honor our U.S. Armed Forces veterans. Please go to our NEWS page to find out how you can submit information about a veteran or active military person for our displays. Please go to our PHOTOS page under MEMORIAL DAY to check out the veterans who are already in our files. If you see a mistake, please contact us so we can correct it. Thank you! Thebes was the Alexander County seat from 1845 to 1860 and the Thebes Courthouse was built in 1848 by Heinrich Arnholdt Barkhausen. scheduling. All Thebes Historical Society members are volunteers and we have no paid employees. A majority of our funds go toward preservation and restoration of the courthouse. A small amount of our proceeds go toward expenses for postage, paper and other minor overhead expenses. No one in the Thebes Historical Society is paid for their work at or for the courthouse. All members are unpaid volunteers.